While perhaps not equivalent to SCARFACE or THE GOOD, THE BAD, AND THE UGLY on my embarrassing-that-I-haven’t-seen-it scale, it is still surprising that it took me ten years to see CAST AWAY (surprising, in no small part, due to the fact that I saw almost every major release that came out my last couple years of high school). But it falls off the list now. There are some SPOILERS below. But, if you are like me, most of this movie is ingrained enough in pop-culture to hold no real surprises. This earned Tom Hanks yet another Academy Award nomination, and it is easy to see why. Playing the title character (both when on and then off the island) he is the heart of this film. Despite the flaws CAST AWAY might have, no one can argue Hanks’ brilliance. While some actors, like Daniel Day-Lewis for example, become someone else when in character, actors like Hanks usually play versions of themselves, but do so in such an appealing manner that we can’t stop watching. So, we have Hanks on an island for four years over the course of an hour and a half. While this film gets knocked sometimes with the toss away ‘Why would I want to watch a guy by himself for that long’, the movie is actually too brief in its island experience. Any LOST viewer is accustomed to seeing that many years on an island unfold over several seasons, over hundreds of hours of viewings. 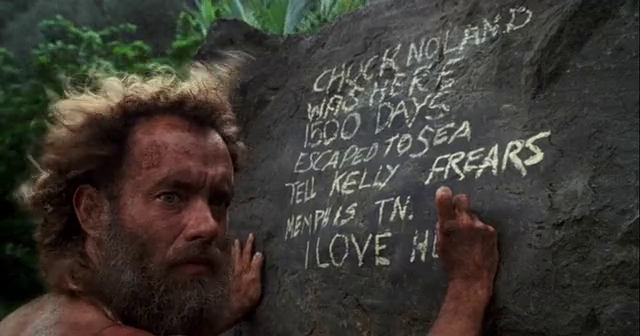 CAST AWAY, in retrospect, is almost too brief, too quaint in scope. As television improves, it often times trumps similarly themed movies. This may be one of those cases. Director Robert Zemeckis has a CASABLANCA ending. Not in brilliance, but in tone. The guy and girl may not be together, but they sure are moving forward. The last moment of Hanks at the crossroads, however, may be about the most heavy-handed last shot of all time. After a two hour plus film of relative subtlety (like the hanging references), the last shot is almost embarrassing. The symbolism, too, is often a bit broad. Wings of angels and blood stained volleyball companions work to varying degrees, and the corporate Fed Ex stamp is ever-present, even on this remote island. More nicely handled are the objects of every day waste or taken-for-granted use that Hanks discovers upon his return. Sure made me appreciate my lighter, that’s for certain. So what we have here is an entertaining enough movie, with a brilliant central performance, that may not have aged so well. Classic? Not in my opinion. But anything with this quality of work from Hanks bears repeat viewing. I hate to do this, but the CGI hurts to watch. Between this and A PERFECT STORM is it pretty clear that ocean effects were not yet mastered in the late 21st century. Though James Cameron might have something to say about that. ~ by johnlink00 on November 5, 2010.